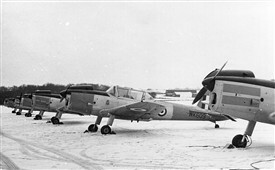 Squadrons: 103 Sqn: 150 Sqn; 16 (Polish) SFTS; 1524 BAT Flt; 93 MU; 12 Group Comms Flt; Nottingham UAS; 9 SOTT; East Midlands UAS; ATC; 644 Gliding School. Things of note: Established during the expansion period and having retained grass runways throughout its use; in some sources is reported as being “the largest grass airfield in the East Midlands”. 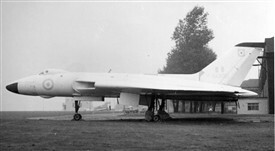 It once housed the RAF's Missile Collection, including the Blue Steel nuclear missile that is now displayed at Newark Air Museum. Used as a location for filming many TV programmes after its closure in March 2001, including 'Robot Wars'. Current status: Many of the original buildings survive for a variety of industrial uses and some of the accommodation quarters are privately owned. Housing developments have taken over some parts of the site and fund raising is underway to raise a memorial to the former personnel that served at the station. This page was added by Howard Heeley on 09/12/2014. 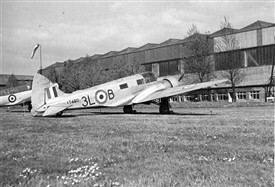 My dad used to take me to the air displays at RAF Newton in the 1950s and particularly remember first world war aircraft flying on these occasions, there was once an Avro 504, SE5 and various others, but when you think about it these aircraft were only 40 or 50 years old in the 1950s, not as old as the WW2 aircraft we see at displays today. Midland General Omnibus Co. ran a special bus for the occasion I rather think it started from Mansfield Market using an AEC half cab single decker probably late 1940s or early 50s vintage which struggled to climb the hill from Gunthorpe Bridge up to East Bridgeford, happy days. Just thinking about makes me feel quite ancient! I served here from 1982 until 1989 firstly with the RAF Police Dog Demonstration Team then with P&SS (NR) as a Firearms and Explosives Search Dog Handler. Many fond memories of the place having also visited on Reteams from 1978 onwards. 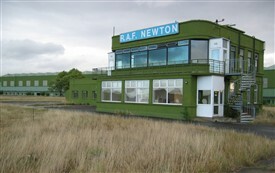 Newton was the RAF Police School and Dog School from 1974 until the unit closed. I remember one of your team being on BBC Radio Nottingham in the 70s on the Dennis McCarthy show. I was very impressed by the different accounts of dog searches by your team.